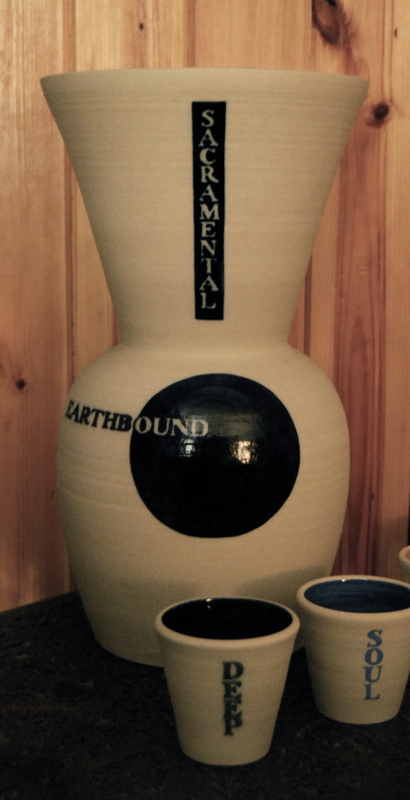 Inner space pots look inwards to the volume contained. Filled with dark blue, azure or warm ochre colours, and glazed within, they are mostly unglazed on the outside to give a pleasing contrast in textures. Sometimes they’re useful for wine and food, and sometimes more contemplative – contemporary abstract artworks for pure enjoyment. These spheres are thrown in white stoneware, glazed inside over a dark blue underglaze, and unglazed outside except for a circular patch of shining gold lustre like the blush on an apple. 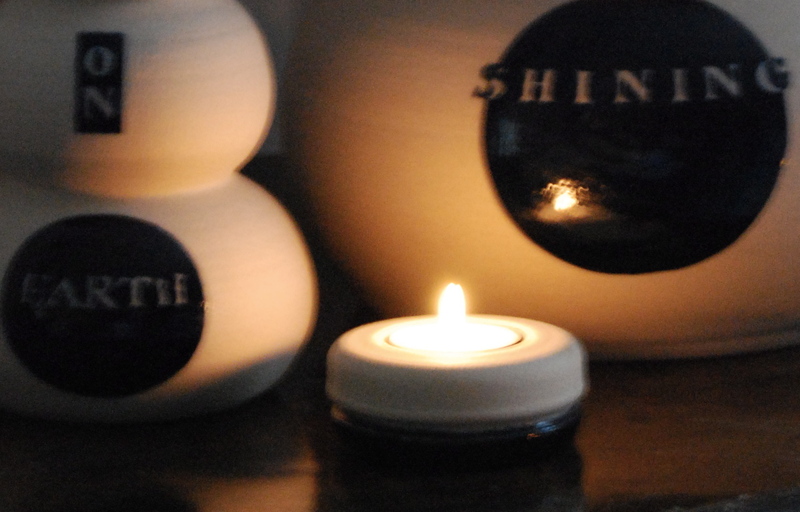 Sizes range from tiny (6cm across) to very large (20cm across) and prices from £20 to £150 (with a 10% discount for 3 or more). These spheres were selected for a Guardian feature on ‘Buying art for your home’. 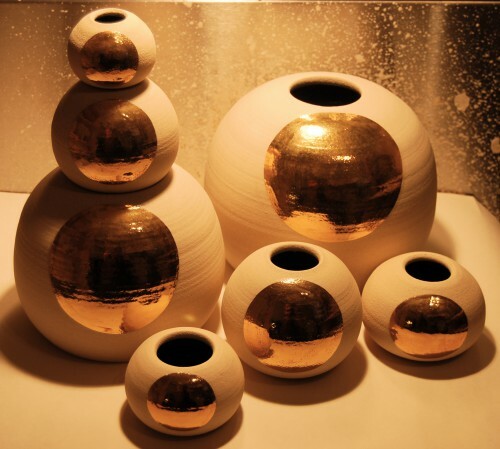 Spherestacks are large pots handbuilt with individually-thrown spheres. 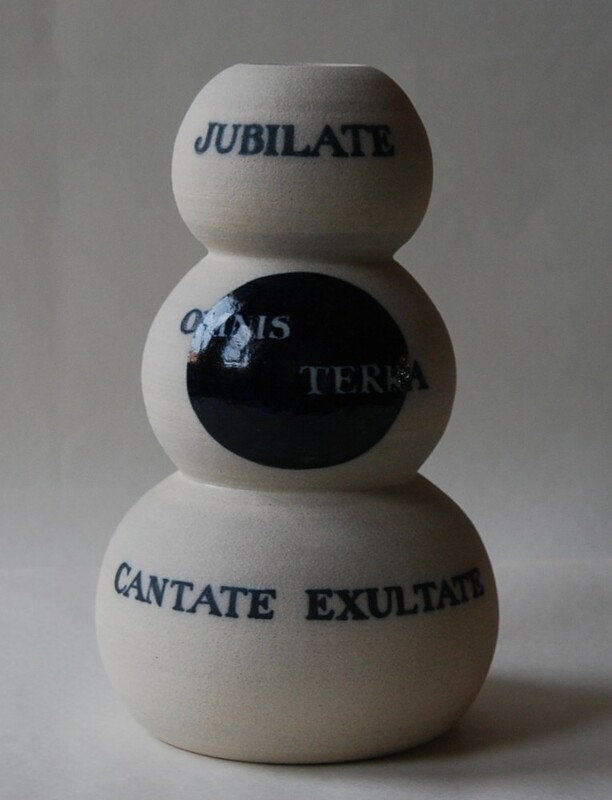 The Jubilate Spherestack is 26cm high, lettered in dark blue on the unglazed clay, with a glazed dark-blue ‘window’ through to the shining dark blue within. The celebratory inscription is from the Psalms; my free rendering would be something like Rejoice, all the Earth; sing and celebrate! Signed one-off; 26cm high; for sale £150. This very tall jar is dark blue and glazed inside, while the outside’s stoney matt texture is the lively flecked creamy colour of the fired stoneware clay, except for the glazed ‘windows’ of the same dark blue that give an entry into the volume enclosed. Long live Bacchus, and long live love! Signed one-off; 26cm high (2 bottle capacity); for sale £140. 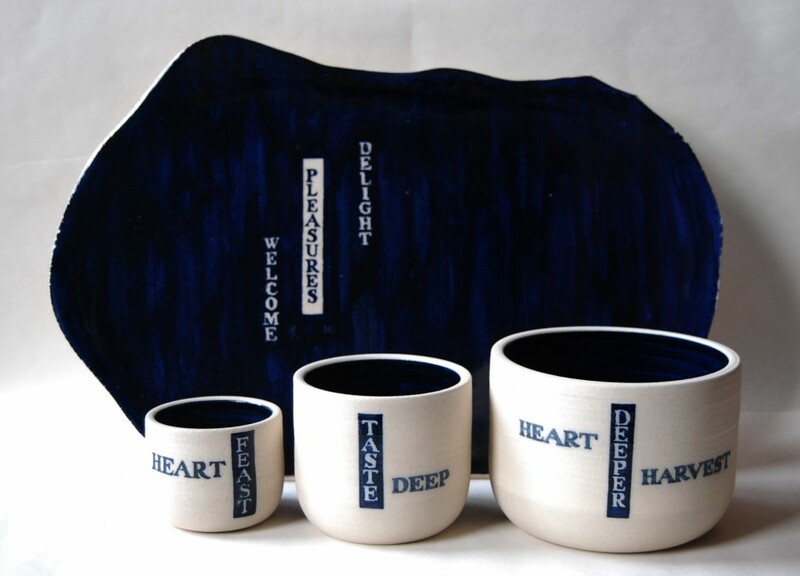 The Heart feast plate is hand built from a slab of stoneware clay (not thrown), hence its wavey edge and unique shape. It’s dark blue above, unglazed below. Signed one-off; 33cm across; for sale £100. The Taste deep bowl is unglazed outside, full of shining dark blue inside. Signed one-off; 11cm high; for sale £50. This complete group is for sale for £260. (£30 discount from total). This large Welcome pleasures serving dish is handbuilt from a slab of clay, not thrown, so it has a lively unique shape and feel, with an irregular edge. Perfect for serving little crispy things at parties, or a romantic shared dish. Signed one-off; 52cm x 36cm at largest width and height; for sale £120. The three bowls are dark blue inside, unglazed outside, good for serving snacks or vegetables; the dark blue sets off the colours of food beautifully – peppers or strawberries or clementines. Small bowl 8cm high £30; medium bowl 11cm high £50; large Heart harvest bowl 12cm high x 17cm across £90. Other bowls available in these sizes. 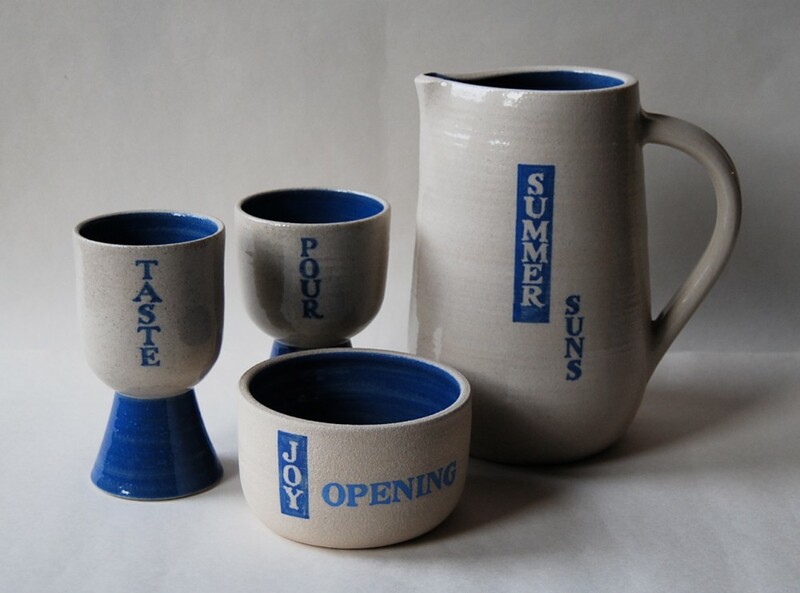 This group looks forward to summer – a large jug for chilled cider, wine or Pimms, with an inscription from John Clare’s Cool draughts from summers sultry suns, a pair of stemmed cups, and a bowl for the pistachios, all full of a summery azure blue. These strong pots are good for using outside. 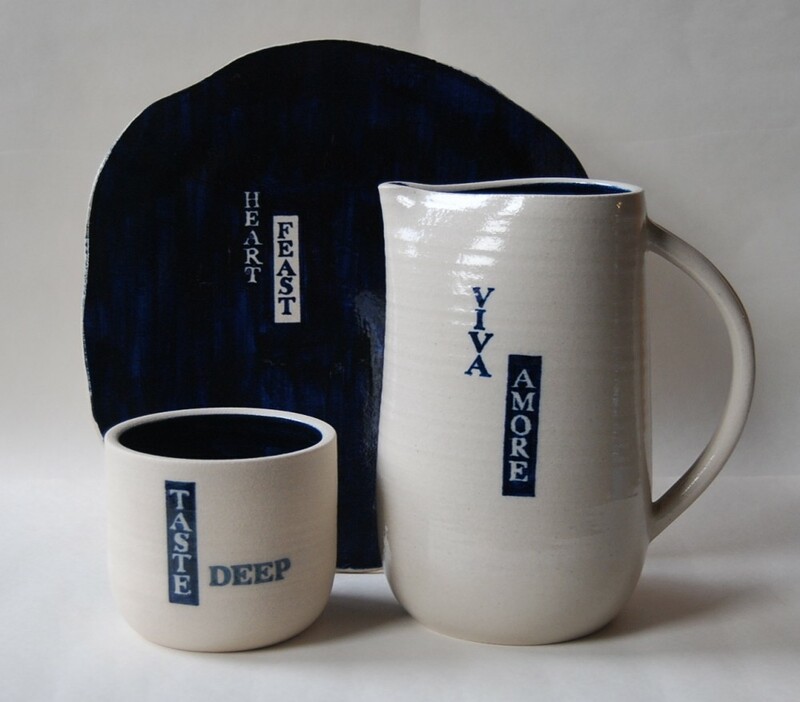 Or for the Jug and cups £110 (£20 discount). Work available for purchase changes constantly – please leave me a note in the comments box below or click on contact details for information about what I have for sale at the moment. I have chanced on your website, and love your work. Meanigful and frivolous text with absolute precision- Its some where I am leaning- but your work is brilliant. Thanks very much for this, Jude. It’s strange but good to hear your response to my work from the other side of the earth.